Another of my recent creations is this medieval style head dress. 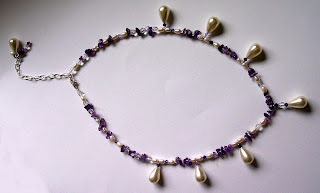 This has been designed for an overseas client to wear with her "old world" wedding dress. The bride is to wear a scrf veil. 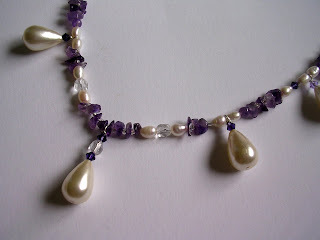 The freshwater pearls, crystals and amethyst are worn with the central pearl drop in the centre of the forehead. The weight of the headress will keep the veil in situ. 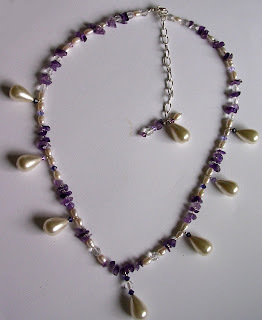 At the reae of the headress, there is an extension chain with tiny dangles on the end. This is to allow the wearer maximum comfort and also to provide detailing at the back. This style medieval head wear can be adapted to suit your requirements.